After the joy of participating in my first swap I couldn't help joining in when The Strawberry Swap opened up on Instagram. I mean, strawberries! What's not to love! As part of my gift for this swap I drafted a large scrappy strawberry block (shown below) to use on a cushion and I thought it would be fun to share how I made it. The best part about this block is it uses scraps! The pinks (or reds) can be cut from any number of different fabrics (I used 5). For the calyx (green bit) I used three different green fabrics (A, B, and C) to create the definition of the different leaves and stem. The block finishes at 7.5 in by 10.5 in. Our first job is to turn the 2.5 in squares into half square triangles (HST). Take the 5 white 2.5 in squares and one of the Green Print A 2.5 in squares and draw a diagonal line across each square from one corner to the opposite one. Pair the marked squares with the unmarked ones. NOTE: the marked Green Print A square should be paired with a Green Print B square. Sew the squares together a scant quarter inch from your guide line. When you reach the end turn the square around and sew a scant quarter inch from the guideline on the other side. You should have two seam lines each a scant quarter inch from the guide line. Cut along the guide line, dividing your square into two triangles each with a seam. Press. I like to press my seams open as it keeps everything lying flat and keeps the seams from getting too bulky. It's likely that your HST will be a little large so trim them down to 2 in square. Line up the 45 degree line on your ruler with the diagonal line of the HST and trim two of the edges. Rotate the HST 180 degrees making sure to line up the already trimmed edges with the 2 inch line on the ruler. Trim the remaining two edges. You should end up with 12 HST. Arrange all 2 in squares and HST as shown in the picture below. Assemble the block using a quarter inch seam. First sew the squares into rows and press the seams. Then sew the rows together matching the seams in each row to create the final block. Press seams. And you're done! If you have any questions please feel free to ask in the comments and I will answer there. If you do make a strawberry I'd love to see it. Leave a link to your finished block in the comments or if you post to Instagram tag me @skyberries. Enjoy! I mentioned yesterday that I finished my Sea Breeze Mini Quilt with a single fold binding which creates a finer edge than a double fold binding. I took some pictures as I went and thought they might be helpful if you'd like to create a single fold binding on your own mini (or quilt of any size!). Please note this is not a comprehensive binding tutorial and assumes you know the basics of making a double fold binding. For this binding you will cut your strips 1.25in wide. This is a bonus if you only have a little bit of your chosen binding fabric as it uses much less fabric than a double fold binding does. For the Sea Breeze Mini I found that three strips the width of my fabric was more than enough. I joined those three strips into one long strip by placing them at right angles right sides together and stitching diagonally across the corner (not pictured) I then sewed it to the front of my quilt sandwich using a quarter inch seam mitring the corners as I normally would and joining my ends at the start/finish. I then pressed the binding away from the quilt (shown below from the back of the quilt) all the way along the edges but not at the corners. Working from the back of the quilt I folded the binding down so that the raw edge of the binding nearly reached the raw edge of the quilt sandwich. I then folded it down again, pulling it snugly down against the edge of the quilt and hiding the raw edges of both the quilt and the binding inside. I used Clover clips to hold my binding in place, but you could also use pins or bull dog clips. The corners are a little fiddly as you have to make sure to tuck all the raw edges in as you fold the binding down. I didn't think to take a photo of it, but principle is the same as for the edges. Finally I finished attaching the binding by hand. This method creates a lovely finish on smaller quilts and is always my favourite way to bind a mini. I hope you found these pictures helpful. If you have any questions feel free to leave a comment and I will reply in the comments section of this post. 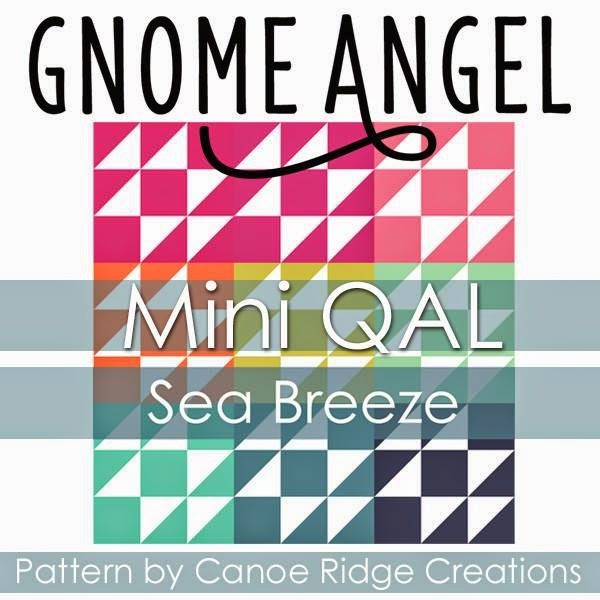 Today is my turn on GnomeAngel's Sea Breeze Mini QAL blog hop and I'm so excited to share my work with you. A special hello if you're here for the first time. It's lovely to have you visit! If you're new to this QAL the pattern we're working on is the Sea Breeze Mini Quilt by Megan of Canoe Ridge Creations. It's a sweet little pattern with so much scope for variation depending on how you arrange your colours. The first thing I noticed about this mini was secondary patterns created by the white half square triangles (HST), and the star pattern they create in the top left and bottom right corners called to be highlighted. 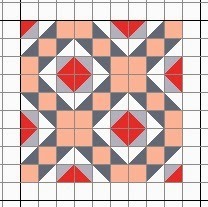 As I mixed and matched colours (in an old cross stitch design program because I don't have any quilt design software!) further patterns began to emerge that I hadn't noticed at first. I realised that the plain squares in each block create a diagonal grid leaving a square in square pattern in the gaps. This is the layout I decided to use. I chose to use peach and coral as my main colours largely because I have used so much blue and green recently that I wanted a change! And they play so nicely with these grey solids. I love scrappy quilts too so I used a number of different coral and peach fabrics but made sure they were almost exactly the same shade so that the pattern would still read clearly. To create this pattern all nine of my blocks are exactly the same. I made HST with the dark grey and white together and the coral and light grey together. I pressed my seams open as I love how flat this makes the quilt and also I find my piecing is soooo much more accurate when I press this way! I arranged my squares as pictured below and sewed them into blocks. The blocks are then arranged at alternate angles to create the final pattern. I'm really happy with the finished result! I had an idea to quilt the square in square areas with closely spaced straight lines and after a lot of turning and burying thread ends (and maybe a little unpicking...) it turned out better than I imagined. I used the dark grey solid for the back and pieced a strip of coral and peach scraps to make up the width. I used white thread for both my top and bobbin and I love the way the quilting shows on the back! As single fold bindings don't seem to be as common I took some pictures of my process and will share a mini tutorial tomorrow on how I created my single fold binding. If you're interested in finishing your mini with a finer edge please pop back and have a look. I've so enjoyed being part of this QAL and seeing everyone's progress. Looking forward to seeing your finished mini's! At the beginning of this year I made a goal. Dispose of the six well used (read falling apart!) cushions that have served us well and replace them with handmade cushions. Well the year is half gone and so far one cushion has been made... But it finally has a new friend! Meet my plus cushion! My original plan was to reuse the cushion inserts from the old cushions in my new ones but the layout of pluses on the front meant that this cover turned out too big for the old inserts. So a quick trip for a new insert was required before it could be truly called done! The finished cushion is 15 in square and is plumply stuffed with a 16 in cushion insert. It has a hidden zipper closure on the back. While my blogger voice has been quiet the past week I've been hard at work in my sewing room when ever I find a spare moment. For my efforts I have one finish, one project well progressed and two new projects (what?!? Doesn't everyone add two new projects for every one ticked off?). I'll show you the finish later in the week but for today here's some progress shots of my WIPs. My Sea Breeze Mini is pieced, basted and well into the quilting phase. I've chosen to quilt it quite heavily in some areas and it's taking me forever but I like how it's turning out so that's ok. Here's a peek at some of the quilting on the back. Don't forget to check out the Sea Breeze Mini QAL. Angie has also posted an interview with Megan of Canoe Ridge Creations so be sure to pop on over for a look! Having thoroughly enjoyed my first ever swap experience with the Schnitzel and Boo Mini Quilt Swap (although I'm still waiting for my mini!) I couldn't resist joining the Strawberry Swap that is happening on Instagram right now. I'm really enjoying plotting ideas and gathering all my strawberry themed fabrics (and maybe buying a few new ones!). Here's my progress so far. And my newest little project is a set of open wide pouches as a gift for a friend. WIP Wednesday and Gnomeangel's Sea Breeze Mini QAL! Just popping in today with a sneaky peak of a most secret project. 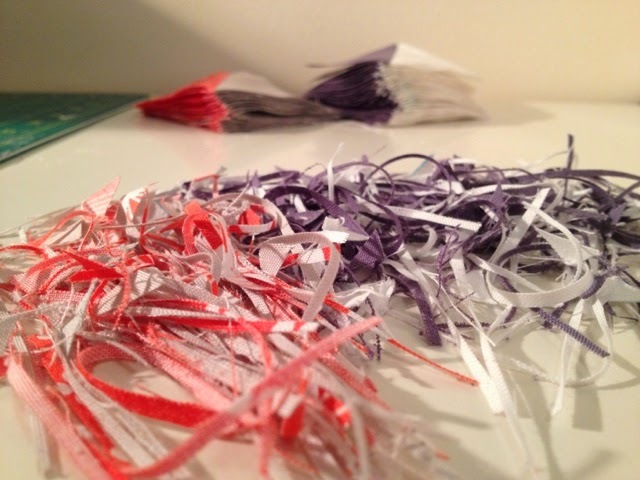 What I can tell you is that these scraps are part of an exciting upcoming QAL hosted by Angie from GnomeAngel. It's the Sea Breeze Mini QAL and its something to get excited about! The pattern is by Canoe Ridge Creations and is available here. There's a blog hop and Instagram hop going on to accompany the QAL and this blog is one of the stops (woohoo!) hence my early preparations. I look forward to sharing the finished masterpiece with you in a couple weeks. Head over to this post by GnomeAngel for more info about the QAL. Hope you'll join us! I'm pleased to say I've finished up the quilt top I've been working on for myself. It came together so quickly once all those squares were cut. I planned it as a lap quilt but it's turned out bigger than I anticipated. I'm a tall person and find that throw rugs are always too short to cover me completely so I made this one extra long. I also have a thing for square quilts so it's extra wide too. I'm not looking forward to pushing so much bulk around during quilting but I can't wait to have it done! It finished at 72" x 72". Long enough for all of me to snuggle under and wide enough to fit the whole family! It doesn't look too shabby on the bed either!